The mathematical answer is primarily based on the Debt-to-Income Calculation, also known as the debt ratio or DTI. This ratio determines how much debt a person can carry and this figure in turn is used to determine the maximum loan amount a borrower would qualify for. The lifestyle answer is based on a more holistic view of your budget, finances and financial goals. Let’s start with the DTI answer. Lender’s determine what is the maximum DTI they will allow for a particular loan product. The DTI might differ from lender to lender even for a similar loan product. For example, one company who provides a physician home loan might allow a 50% debt ratio while another company may max out at 45%. This means that one of the first questions a home buyer should ask of a loan officer is “What is your allowed maximum debt ratio?”. The DTI is a simple ratio with all monthly debt payments listed in the numerator over all monthly income listed in the denominator. While simple, there is often the question of what exactly is included in the ratio. On the top line of the equation, the minimum monthly payments on all debt are counted, including payments on car loans/leases, credit cards and personal loans. Monthly payments that are not debt do not get included. Items such as day care, utilities, children’s education, life/disability/auto insurance and dollarshaveclub are example of what do not count as debt. Court ordered monthly alimony and child support, while not debt, are included in the ratio’s top line. Also included is your anticipated TOTAL home payment, your PITI or Principle, Interest, Taxes and Homeowner’s Insurance. You may need assistance from your Loan Officer or real estate agent to get this number as you have to start somewhere with an assumption. The million dollar question that impacts most graduating medical students and residents is how are student loans taken into consideration if they are in deferment, forbearance or in a special payment plan such as IBR or PAYE. The reason this is a question/issue is because how a traditional mortgage looks at student loans and how a physician mortgage looks at them are very different. 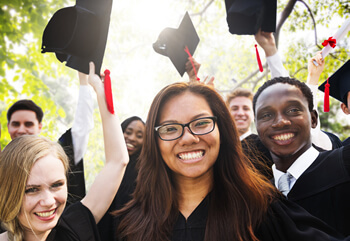 A traditional loan will count the full expected monthly payment on all student loans in the debt ratio UNLESS you can show proof that you are on a modified plan for the next 12 months. The challenge is that that proof is not typically available, especially to a graduating medical school student. Always be sure to ask your loan officer how are student loans handled, what payment will be used in the DTI and what documentation is needed as proof of monthly payment used. The denominator, where monthly income goes, may seem easy but there are specific rules to follow. Guaranteed base income, whether it is W-2 or 1099, is included. Not every company will count 1099 income though so that is a question to ask of your loan officer. Commissions, bonuses, and non-guaranteed pay must have been earned for at least two years in order to count. For example, an ER doc that is hired as an independent contract with a guaranteed pay of $250K per year based on contracted shifts can count that income in the debt ratio. But additional hours worked, moonlighting or bonuses would not be included if the doctor does not show a 2 year history of receiving that income. This means the ER doc can qualify for a home based on a $250K salary and not on an expected $300K in total pay. When discussing what can be included in income, rental income comes up a lot. There are a few rules to be aware of. To include rental income, you must show a two year track record of it on your tax returns. This means that if you plan to rent out your current home upon buying a new home, expected rental income cannot be counted, even if you have a rental agreement in place to take effect once you move out. Even when you do show a two year history, an underwriter will typically only count 75% or so of the rent in order to account for vacancy/turnover. So once you have your debt ratio, using the maximum monthly payment you plugged in for the home expenses, you can back into the calculation to determine the loan amount. Say that you used a monthly Principal and Interest of $2000. This equates to aprox. a $430K loan amount. You get this by going to a mortgage calculator and solving for loan amount using an estimated interest rate over 360 months, or your loan officer can run the numbers for you. The question of how much you can qualify for is solved. However – as I mentioned at the start, aside from the DTI calculation, there is the lifestyle consideration. Just because you qualify for a $2000 mortgage which is a $430,000 loan, doesn’t meant that is how much you should borrow. Just because a lender offers a 50% debt ratio does not mean you should set that as your target in determining how much of a house to buy. At 50% DTI you are not left with much room for anything beyond basic living expenses. So once you figure out what is the maximum amount you qualify for, how do you determine what is the amount you should actually finance? That is another discussion for another day.